Babies need their own space, not only for playing but also for doing their tasks. If you start buying all that the market offers then you will spend a lot of money and maybe you will finish purchasing useless things. So before going out looking for something on purpose check for a while the things you already have that can be restyled, adjusted to them. 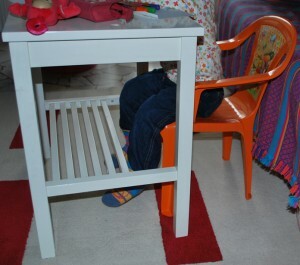 I love craft and that took me to recycle to create new things, then I was thinking it is time to get a table and a little chair for my little queen.. but it came to my mind, hey what if I modify that Ikea’s night table that I’m not using anymore.?? This tiny table has 10 years! and has done a lot.. it has survived to a move and for a year was carrying a huge printer, so it is done! I took off some wood sticks in order to let the chair get in and have my baby be sit comfortable and got a Winnie Pooh plastic chair!, so with Eur 5,00 I could manage ( not bad eh?). Well I’m glad my recycled table was really appreciated.. but I’m not sure if it will survive to all the colouring, if so my congratulations to Ikea and surely I will look how to re style it again in order to make it be a night table ! !